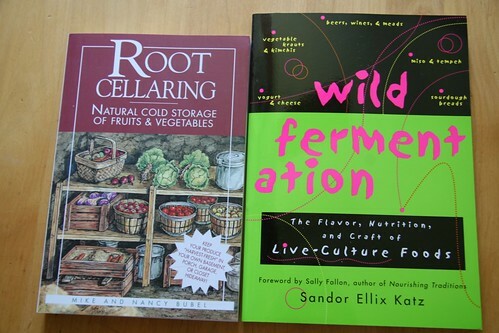 I read an article recently in the San Francisco Chronicle about how restaurants are getting more creative with their ingredients due to this faltering economy. Many Bay Area restaurants are using beet greens that were previously disregarded as a menu worthy side dish and including tasty but usually overlooked broccoli stems (my favorite part) in their stir fries. 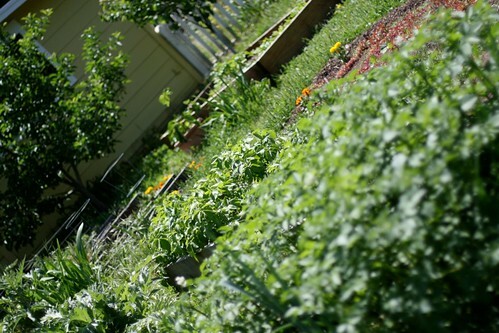 For most of us who have been gardening and eating consciously for a while, that’s old news. You’ve probably already included those healthy bits in your diet, but recently I’ve been finding out that there are some more unusual, yet commonly found things that are completely edible. Two weeks ago we went to the Marin Farmers Market and saw a bundle of allium buds sitting alongside the lettuce, chard and other leafy greens. I asked, ‘can you really eat these?’. Why yes! was her answer. Apparently you can roast, saute, or steam any onion, garlic, shallot, leek or chive flower buds that you might find growing in your garden. The other night we went bud collecting and sauteed them with sliced garlic cloves. 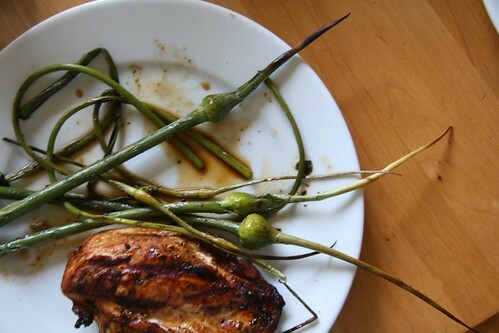 While we both really liked the small garlic buds, I wasn’t too crazy about the large leek buds. They were a little mealy tasting. But garlic flower buds, I would highly recommend. I bet chive buds would also be good. Who knew that peach leaves could be edible? Well maybe not edible, but useful in flavoring what you are about to eat. 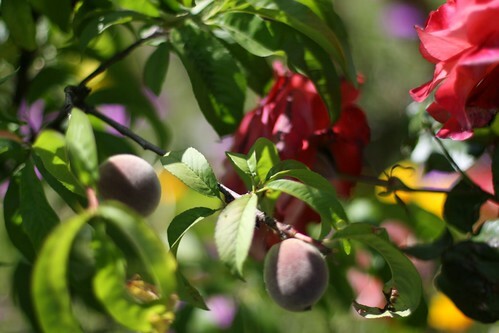 Someone, at some point found out that peach leaves impart a beautiful almond and floral flavor to whatever they might be steeped in. You can pick a few brand new tender peach leave to steep in milk for about five minutes and use that milk to make ice cream or a peach leaf custard. 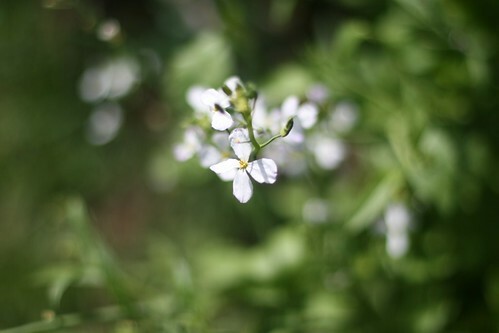 Cilantro is renown for how quickly it bolts (flowers), but the good news is that when you are ready to pull it up, you can harvest the cilantro roots and add them into your dinner! 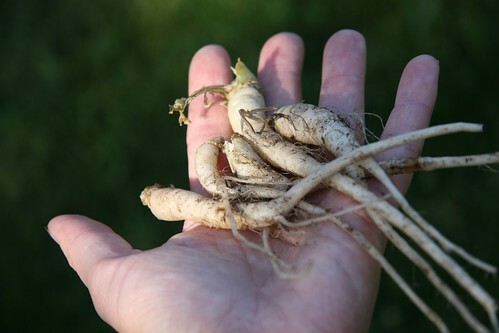 Check out this list of cilantro root recipes. This was a new one to me this year too. 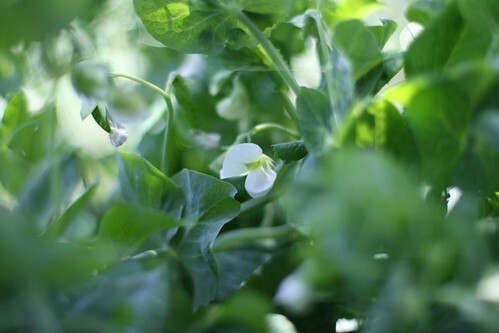 You can actually eat the entire pea plant when it’s young. Asian cultures regularly add them to their stir fries and there is even an entire website devoted to pea shoot recipes. I recommend eating them as young as possible because once they get too old they get pretty fibrous and unpleasant to eat (chew, chew, chew). While you may not want to harvest large mature broccoli leaves because of their toughness, young leaves can be quite delicious. I did a post on this last spring if you’d like to read more on how you can eat broccoli leaves. What other unusual parts of plants have you tried? Onions, Potatos and Daikons. Oh My! While it’s easy to see what’s growing above ground, it’s a bit of mystery on what’s growing under the ground, so we get a little curious and start to peek. 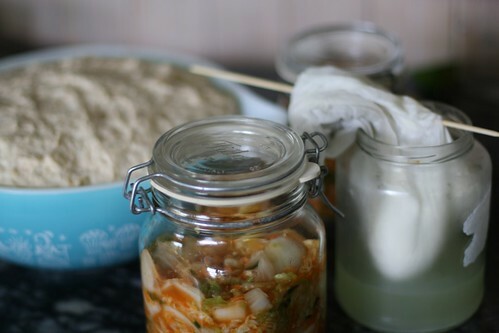 We knew the daikons weren’t going to do well for us this spring, but we are so into our new kimchi recipe that we couldn’t wait until the recommended fall. Well it serves our impatient nature right by bolting straight away and giving us piddly little roots. Have you seen them at the farmers markets? Daikon’s can be monsterous! We’ll try again in fall. Back when we first planted our onions at the very end of January I counted forward 100 days (the tags estimated date of maturity) to May 5th. We’ll they aren’t ready. 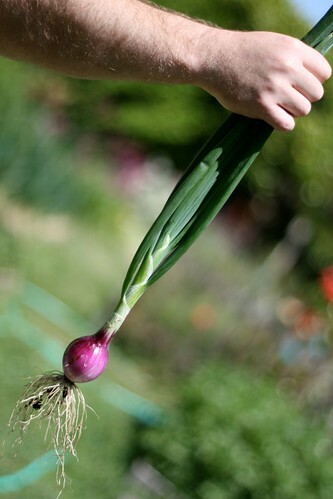 Not that we haven’t picked a few to use as young spring onions, but it’s not time to pull them out and let them dry. We’ve still got at least a month to go. I’ll let you know. 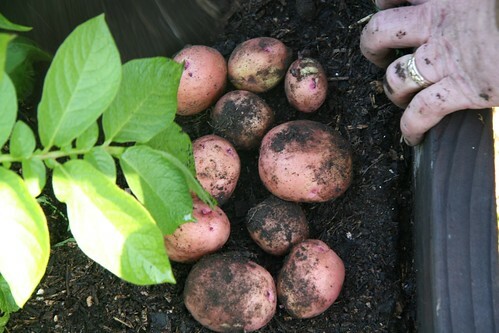 We planted our potatoes on the same day as the spinach and daikon seeds, February 27th. And it looks like we’ve gotten our moneys worth on the Red Golds at least. We planted 1lb of them in this box and from one plant we’ve gotten 1.2lbs. Six more plants to dig. Of course this isn’t anything close to Sinfonian’s 100lb of potatoes, but it’s enough to enjoy with dinner. They were the creamiest potates I’ve every had. 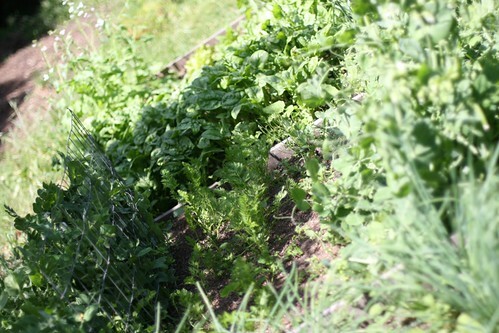 We grew two types of spinach next to each other this spring. Bloomsdale Long Standing and Merlo Nero Spinach. We were looking to see if we had a spinach preference. Maybe one would grow better, maybe one would taste better? Maybe one would be less prone to insect attacks.We enjoyed growing our watermelons together last year to pick a favorite. So we hoped to see a big difference. So today I asked Scott while he was harvesting it all what he had to say about the spinach growing experiment. Did he notice a difference? His comments were, “they both grew, they both bolted, and they both taste good.” So there you go folks. The in-depth analysis about the two spinaches. To be more specific, we planted them from seed on February 27th, and they had already started to bolt when we picked them today, so maturity for both Bloomsdale and Merlo Nero was about 10 weeks for us. Spinach in general likes to grow in cooler weather and I’ve read that it’s best to start it 6 weeks before your first frost in fall and 6 weeks before your last frost in spring. Pretty easy to remember. When the days get too long in spring, that’s when they start to bolt, which is exactly what’s happened to us. Especially after this past weekend’s heat wave (which hit at the exact same time as last year!) No matter though, we had a good crop. 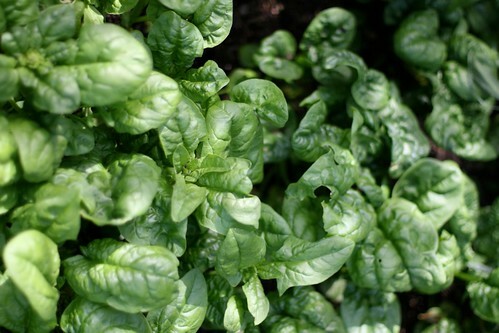 The Bloomsdale spinach was a little less savoyed (or crinkled) than the Merlo Nero and the leaves were also slightly lighter in color and more delicate in nature than the Merlo Nero spinach. The Merlo Nero definately had more heft to the leaves. Maybe you could say that the Merlo Nero spinach is better for cooking and the Bloomsdale is better for fresh salads, but in the end, they are both great spinaches. We eat a lot of spinach. We heard once that the average American eats about 3lbs of spinach a year and I think we far exceed that in our diet. It’s just so good. You can eat it raw, cooked, braised, pureed into smoothies, wilted in salads, hidden in raviolis… the possibilities are endless. I bet you eat a lot of spinach too. 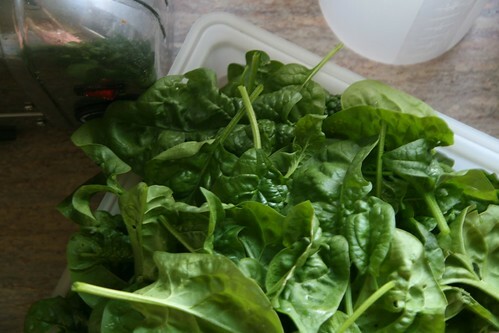 Time to make Spinach & Green Garlic Soup! Do you have a favorite spinach variety? Looking past potatoes to the apple tree. It’s been a long time since I’ve done a State of the Garden update. I’ve been in a bit of a blog/garden/photography slump, mainly due to how busy we’ve been, but I’m hopeful that this summer we’ll be able to slow down a bit. So I’m wondering, would you like to work together to make our gardens better? I’m thinking of hosting something along the lines of “30 Days to a Better Garden” all June that would get us all motivated to get out in the dirt and help our garden grow better. Would you be interested in taking part. Every day I would post a garden tip that would be on the easier/cheaper side to do. If that sounds like fun, leave me a comment! 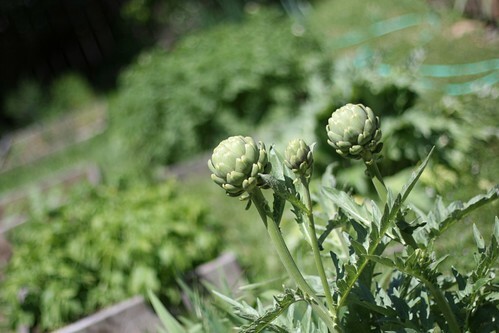 We’ll have artichokes for dinner soon. The weather here has been stellar. It’s the beautiful time of year when we don’t need to use the heater or the air conditioner. We can leave the windows open all day and not be too hot or cold. The cherries are just starting to turn red and we’ve been munching on homegrown strawberries. How’s the weather where you live? 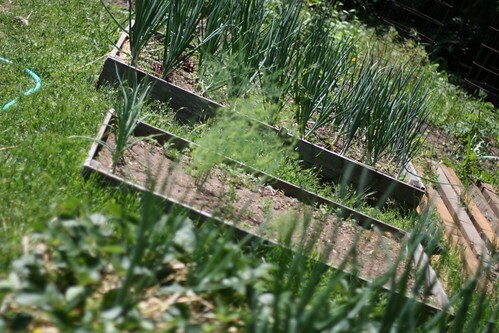 Looking from strawberries and onions to the asparagus bed on to the onions. The birds, bees, ladybugs, soldier beetles and other buggies are working full time to keep the garden in it’s proper working order. Life’s pretty good these days. 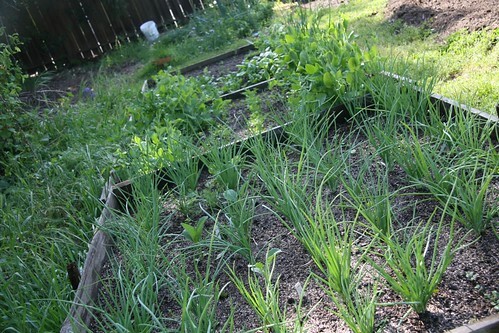 The back bed, full of peas, carrots, spinach, lettuce and bolting daikon radishes. We got to see inside our oldest sons hand last week. And if you remember from the last post, when we last got to see inside his hand we saw among other things that his young hand were still in the process of growing. This time we saw that we’ve been doing something right because his hand is growing in the most normal of ways, well at least until he broke it. Fascinating to see the changes that have happened, and fascinating to see the obvious break. And so we go about our job of feeding him even more healthy and nutritious foods in hopes of helping him heal a little bit faster. 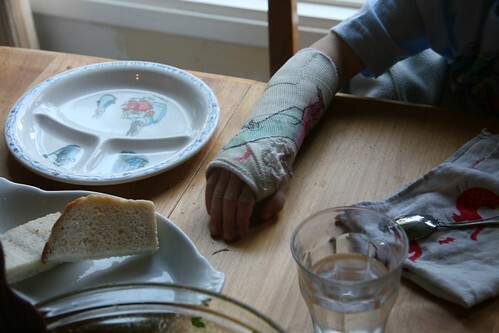 Which promptly began with a treat of ice cream and a t-rex illustration as soon as the cast was put on. In the very same week they looked inside of my grandma and saw how her kidneys are slowly starting to break down and lose function as is the normal coarse of action when your body gets so old. And they looked inside my sister and saw that her baby is growing well and is expected to arrive next month. It’s not often that we get to use modern technology to look inside of ourselves and our loved ones but it is always a good reminder that one of most important reasons we grow food is to nourish ourselves so that we can help the little ones grow, keep ourselves strong, and help the older ones live as long as they healthfully can.